Herein, we report on the development of an organic FET (OFET)-based pH sensor. To accomplish the electrical sensing of pH, the designed OFET has an extended-gate electrode consisting of a surface-oxidized aluminum film. As a result, the fabricated device linearly responds to pH change in the basic region (pH > 9). Importantly, the organic device has superior low-cost processability, portability, and compact integration, indicating that the OFET with the metal-oxide-based electrode could be utilized as on-site monitoring systems for environmental risk assessment. 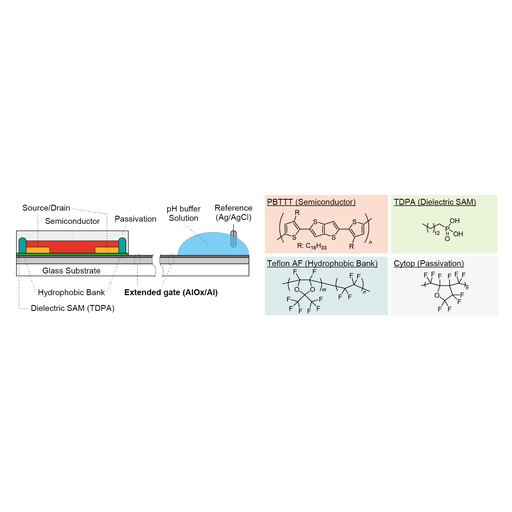 Tsukuru Minamiki, Tomohito Sekine,Michio Aiko, Shiwei Su, and Tsuyoshi Minami, An Organic FET with an Aluminum Oxide Extended Gate for pH Sensing, Sens. Mater., Vol. 31, No. 1, 2019, p. 99-106.